"Remember when videogames were fun? 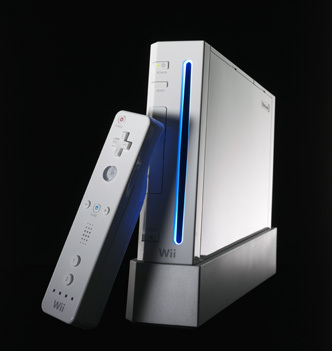 When the controllers had only a couple buttons and you didn’t have to spend an hour learning the seven-step finger dance for “walk?” Nintendo does, so it took a step back, looked at its superpowered competitors, and took a totally different path with its new console, Wii (pronounced “we”). Nintendo’s processor is 75 percent slower than an Xbox 360’s. The company decided that gamers didn’t need to pay extra for photo-realistic renderings of its iconic talking mushrooms. Instead it reimagined the controller, introducing a three-axis accelerometer that transforms your hand motions into in-game action, so you really play the games. In Wii Tennis, for example, swing your hand just as you would a racket. In Excite Truck, hold both ends of the controller as if it were a steering wheel. And look out for that tree, because, photo-real or not, these games will draw you in." More good press for the Wii? Seems like everyone is starting to realize the Wii is really going to do something special, and it's no fluke.